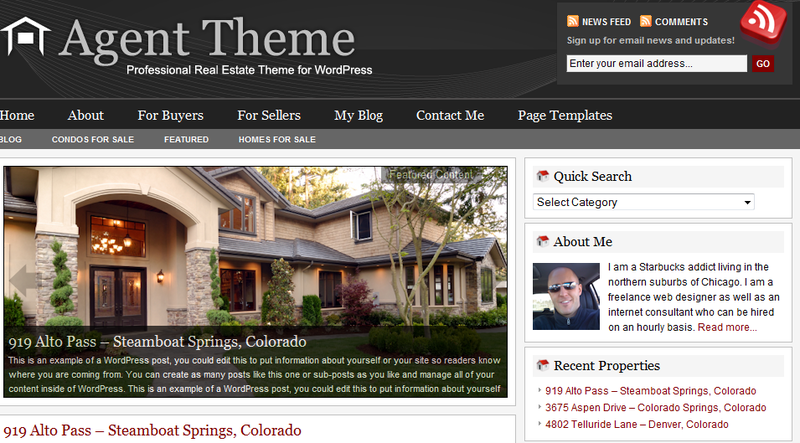 June 29th in Premium Themes, Themes for Real Estate Pros by Wordpress Jedi . As someone who has grown up around 2 real estate agents, I am quite familiar with the challenges of running a real estate business. Sure, you have to worry about passing your license exam and actually selling houses to cover the cost of being associated with companies such as REMAX. But you shouldn’t rely only on phone leads to make sales. You should also use the power of the Internet to generate leads for your business and take your game to the next level. A lot of real estate professionals struggle to figure out a way to put up their real estate website fast. In reality, you’ve got three options. You can either hire someone to design a site for you (which will be expensive), create your own website, or use a WordPress theme to set up an online presence fast. Agent is a premium real estate WordPress theme that is designed for real estate professionals who are looking for an attractive solution to go online fast. With Agent, you don’t have to write a single line of code to go online. All you have to do is get a web host and install Agent on your WordPress website. Agent is not only user friendly, but it’s very well-designed. If you are technical, you can easily change the look and feel and save a lot of money in the process. But what I love about Agent is the fact that it is organic search friendly. Paying for leads online can be a bit expensive, but thanks to Agent, you are going to get free leads from Google and other search engines and save money in the process. Agent Theme comes with dynamic drop-down menus to allow you to easily host multiple property categories on your website. You also get an attractive featured gallery section to promote your top properties to your visitors. The theme is also RSS ready, making it easy for your readers to sign up to your property feed through their browser or via e-mail. What I like about this theme is the fact that you get all the PSD files as well. So if you know Photoshop and illustrator, you can get to work and make further changes to your theme without too much trouble. You also get a comprehensive tutorial for this theme to help you learn how to get the best out of this theme. If you are an aspiring real estate agent looking to take your game online and gain new leads, you should give Agent a try. It’s easy to install and use and won’t cost you a fortune.